Hi, I'm Charity Rowell, book blogger and unapologetic supporter (and advocate) of indie authors. I've been blogging for about 10 years now, and I'm not afraid to stomp on some toes to show my support for indie authors. In 2014 when I received a Kindle for Christmas. I downloaded free apps and indie books on it and started sharing my reviews of them on the lifestyle blog I maintained. I lost my job shortly thereafter and started working with an agency to write paid reviews. I didn't know at the time doing so was a huge no-no on Amazon and Goodreads; however, once I discovered this, I stopped and decided to see if some indie authors were willing to provide me with copies of their books in exchange for some honest feedback. The response was huge! So huge that I ditched the lifestyle blog and created this book blog. My goal was to launch a PR agency for indie authors from this blog, so I started branching out and writing promo posts on here for authors. However, after I was divorced in 2017, I had to find a job to support myself and Lexi, and I started seeing a couple of psychiatrists weekly for PTSD treatment. Between work, blogging, and appointments, I didn't have much time to rest and I was becoming overwhelmed. I contemplated leaving the blogging world and almost did. However, after a bit of a break in 2018, I decided to put my dream of branching out on the back burner and get back to my roots; reviewing books for indie authors. Hope you enjoy reading my reviews and discover some new favorite titles along the way. 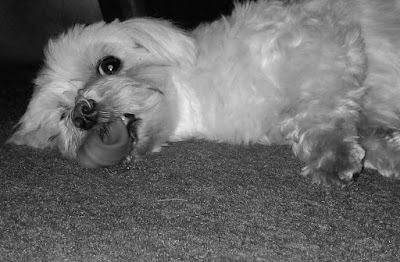 Read on to learn about On My Kindle's mascot, Lexi the Maltese! Hi, my name is Lexi! 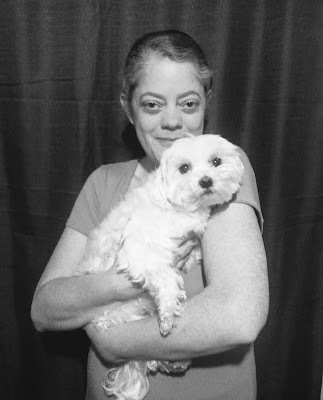 I'm a nine-year-old Maltese and I spent most of my life in a puppy mill. Some nice folks came and rescued me in 2016 and my foster mommy kept me for a little over a month before Mommy and her husband back then decided to adopt me. After Mommy and her husband were divorced, he decided that he didn't want me and gave Mommy full custody! That was fine because Mommy was the one who brushed my hair, brushed my teeth, cleaned my face and around my eyes, and she taught me commands. So, instead of spending weekends away from Mommy, I got to hang out and provide with her the emotional support she needed. I'm an "unofficial" emotional support dog and I'm proud of it! I don't actually write book reviews or anything like that, but I do lay next to Mommy's chair while she works and provide encouragement, or beg for treats; it's all the same. However, I do narrate the weekly "Marvelous Monday" posts on here, and I share a couple of pictures Mommy has taken of me during the week. I hope you stick around and read a few of the reviews that Mommy shares. Who knows, you might just find another author to follow.